South Padre Island is a town in Cameron County, Texas, United States. It is part of the Brownsville-Harlingen Metropolitan Statistical Area. The population was 2,422 at the 2000 census. Many residents of other parts of the Rio Grande Valley or of Nuevo Leon maintain vacation properties in the town. The town is located on South Padre Island, a barrier island along the Texas Gulf coast assessable via a causeway from the town of Port Isabel. South Padre Island is named after José Nicolás Ballí (Padre Ballí), a Catholic priest and settler." - from Wikipedia: en.wikipedia.org/wiki/South_Padre_Island,_Texas. 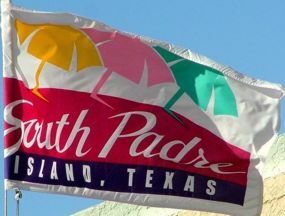 Photo of the town flag can be seen on a Waymarking website: www.waymarking.com/waymarks/WM3FH6_South_Padre_Island_Texas. It is white with town logo on it. The flag can also be found as a small image on a town's website: www.townspi.com/Newsletter/Newsltr2004/May%202004/election_web.htm.